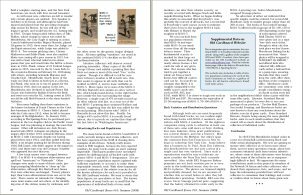 The cover and the table of contents for Issue #16 are shown below. 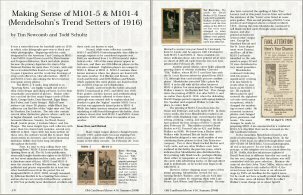 1) "Making Sense of M101-5 & M101-4 (Mendelsohns Trend Setters of 1916)" by Tim Newcomb and Todd Schultz. 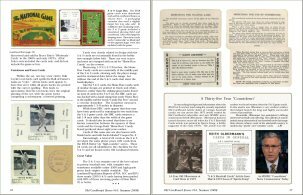 An detailed review of this massive set of 1916 along with discussion of the dates of issue as well as the methods of promotion and distribution, Each of the 18 known sponsors represented on the card backs is also briefly profiled along with back images and relative population estimates. 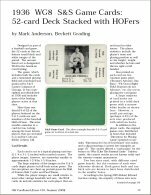 2) "1936 WG8 S&S Game Cards: 52-Card Deck Stacked with HOFers" by Mark Anderson. An overview and update to this familiar game set. 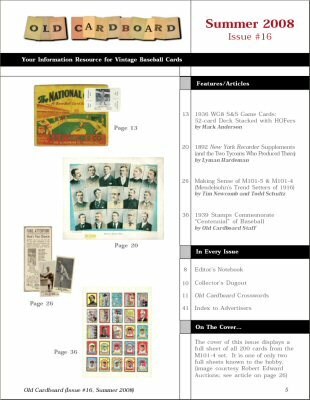 The game includes cards for most of the active players active at the time with more than one-third (19/52) of the set depicting Hall of Famers. 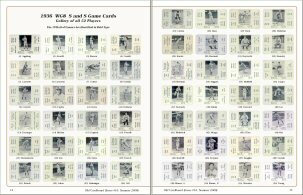 A full gallery of cards is provided along with images of the box, directions for scoring and set variations. 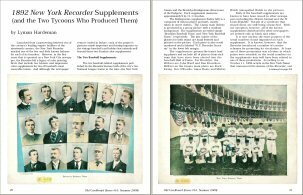 3) "1892 New York Recorder Supplements (and the Two Tycoons Who Produced Them)" by Lyman Hardeman. 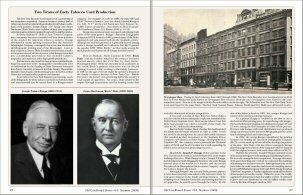 Launched from a partnership between two of the country's leading empire builders of the 19th century, the New York Recorder survived only five years. 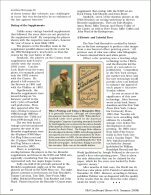 During that time, it produced two very attractive color supplements of New York's two Major League teams of the period. Supplement images included. 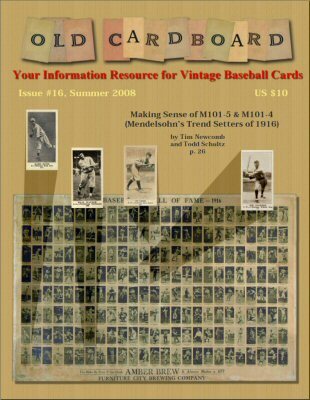 4) "1939 Stamps Commemorate 'Centennial' of Baseball" by Old Cardboard Staff. 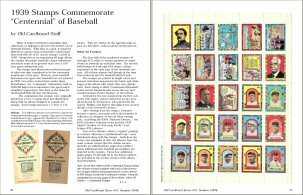 A brief look at the 25-stamp set issued to coincide with the supposed "centennial of baseball" celebrated in 1939. 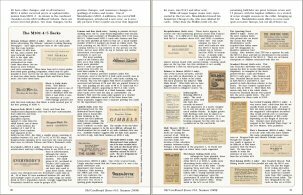 Overview includes history behind the colorful stamps and a description of the albums with which they were originally distributed. 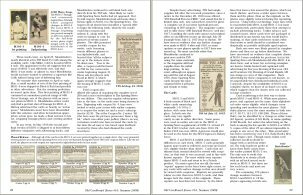 Links are provided to an on-line edition of the album posted on Old Cardboard website.